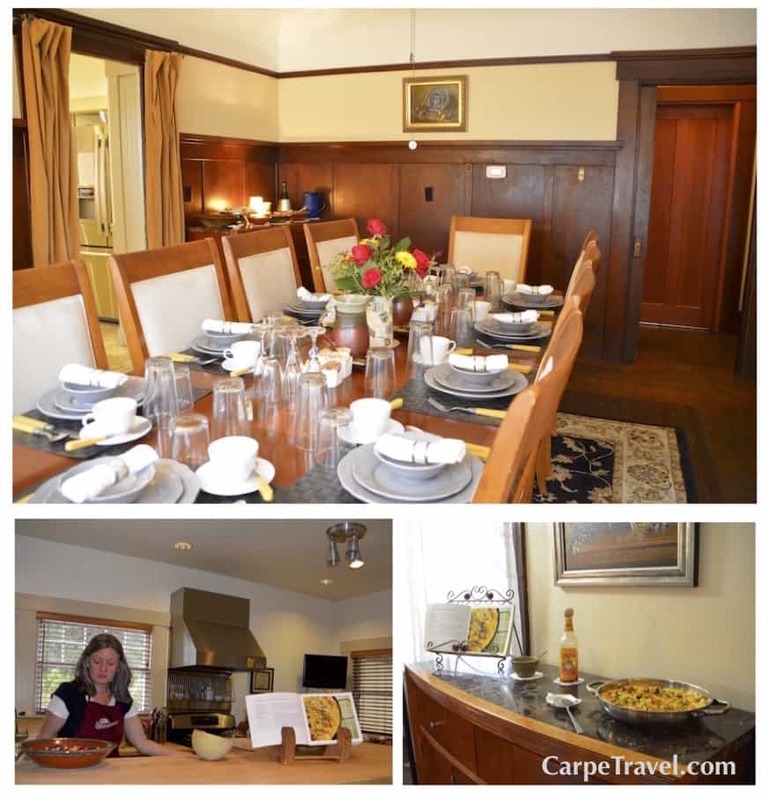 The Craftsman Inn is one of the top rated Calistoga bed and breakfast, and for good reason. 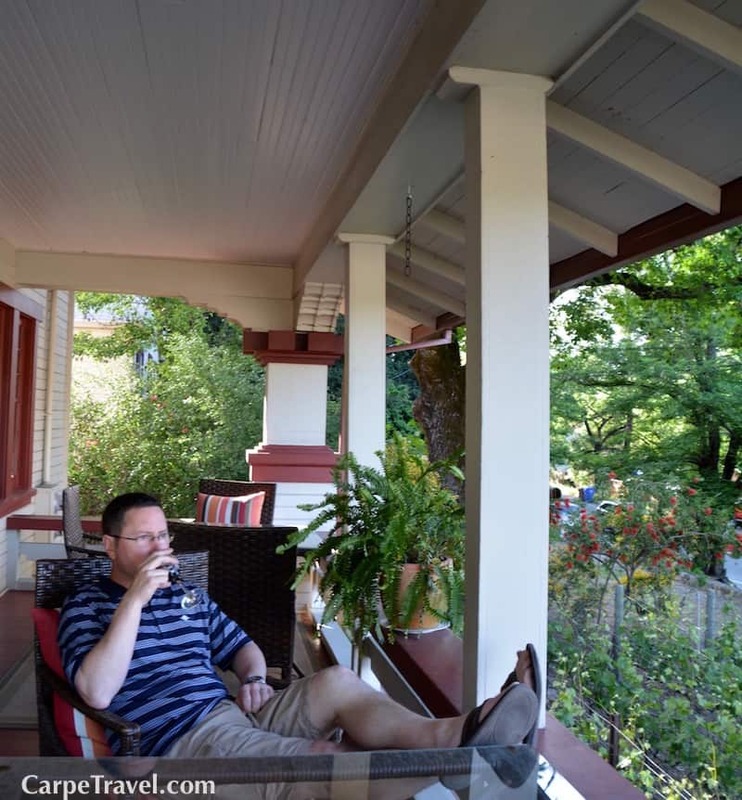 This upscale bed and breakfast occupies a restored 1910 Craftsman house in downtown Calistoga. The house was restored in 2006 and the owners did a fabulous job maintaining the architectural details while evoking both charm and elegance throughout the property. This upscale Napa Valley bed and breakfast is located on Highway 29 near the intersection of Highways 29 and 128 in the town of Calistoga. Given its northern location in Napa Valley, it’s a short drive to into Sonoma County to explore Russian River and Alexander Valley. But, make sure to stick around and explore Calistoga, it’s one of the quaintest town in Napa Valley with a lot to offer visitors. 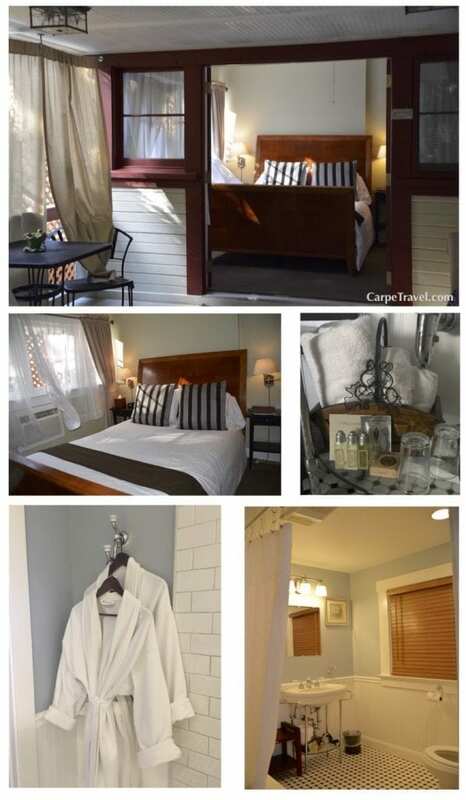 The Craftsman Inn is a short walk – about three blocks – into the main downtown shopping area of Calistoga. From art galleries to coffee shops, bakeries, amazing restaurants and a slew of wine tasting rooms – you may not ever leave downtown Calistoga. I didn’t count the number of wine tasting rooms but you can easily spend a day wine tasting in downtown Calistoga between 10am-5pm. 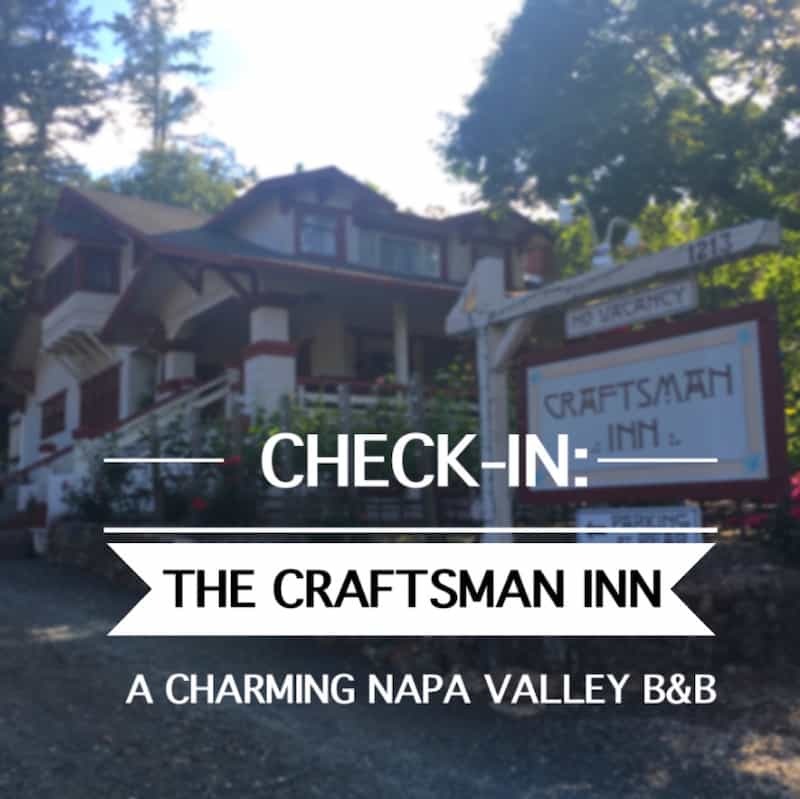 All five rooms at the Craftsman Inn are named for the mountains and cliffs that surround Napa Valley. Each room has a private bathroom, pillow top bed, air-conditioning, plus flat-screen TVs and WiFi. Some rooms have jetted tubs, clawfoot baths and/or private porches. If your room doesn’t have a private porch there are additional outdoor seating areas on the front porch and in the backyard. We stayed in the Spring Suite, a ground floor, one-bedroom complete with a queen bed, a Jacuzzi bathtub and private patio. Since we weren’t traveling with the kids, this sized room was perfect. And, the private patio provided a quite, secluded spot to enjoy my morning coffee. While the rooms and bathrooms have been completely renovated and boast new furniture and modern amenities the owners were able to keep much of the original Craftsman features of the house’s 1912 heritage. They did a great job mixing luxury and history together not only in the Spring room but in the living area and dining area. The full-bath was immaculately clean, freshly updated and featured a shower and a Jacuzzi bathtub and I loved the L’Occitaine luxury toiletries. The gourmet champagne breakfast at the Craftsman Inn, is the perfect start to your day in the wine country. Each morning, breakfast is cooked onsite and served to guests in an elegantly laid out dining room at 8:30am. The wide variety of seasonal breakfast selections range from yogurt, granola, fruit, homemade scones, muffins and breakfast bread as well as a hot, signature breakfast dish. What’s fun about breakfast at the Craftsman Inn, besides eating the food, is that you can take the menu home with you. Actually, ALL the menus. Each dish served during breakfast comes from the owners personal cookbook – Gillian’s Cookbook, Inn Food. I highly recommend you testing out the fritta and cinnamon scones. They are AMAZING! 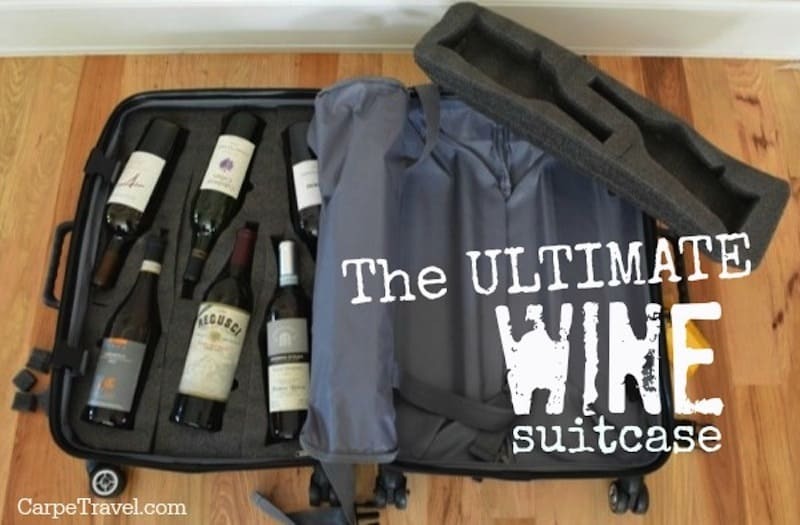 This Calistoga bed and breakfast offers many standard amenities including the following. Yes! The Craftsman Inn offers complimentary afternoon service of local wines. During our stay we sampled wines from Vermil. It was a wonderful treat to pour ourselves a glass of wine and sit on the front porch of the Inn. Gourmet breakfast fresh from the pages of Gillian’s wonderful cookbook, Inn Food. And, it works. Quickly. Consistently. Amazing. You will need to get the password when you check-in as it’s not written down anywhere in the room. This actually may not be a standard amenity for many hotels these days… After paying $60 for parking recently at hotel I wanted to make sure to point out the Craftsman Inn does in fact offer free parking. The rates will vary based on the room you book, what day of the week, as well as the season. (Weekend rates and peak season rates will be higher.) Rates are between $150-$450 a night. This Napa Valley bed and breakfast does offer a host of specials and packages so make sure to check them out before booking. This Calistoga bed and breakfast offers the comforts of a boutique hotel in a bed and breakfast setting. This is a great Napa Valley bed and breakfast! It’s not surprising the Craftsman Inn has been rated so well by multiple third-party sites. The rooms are clean, spacious and the entire property offers is brimming with history in an elegant and relaxing setting. The gourmet breakfasts are delicious! 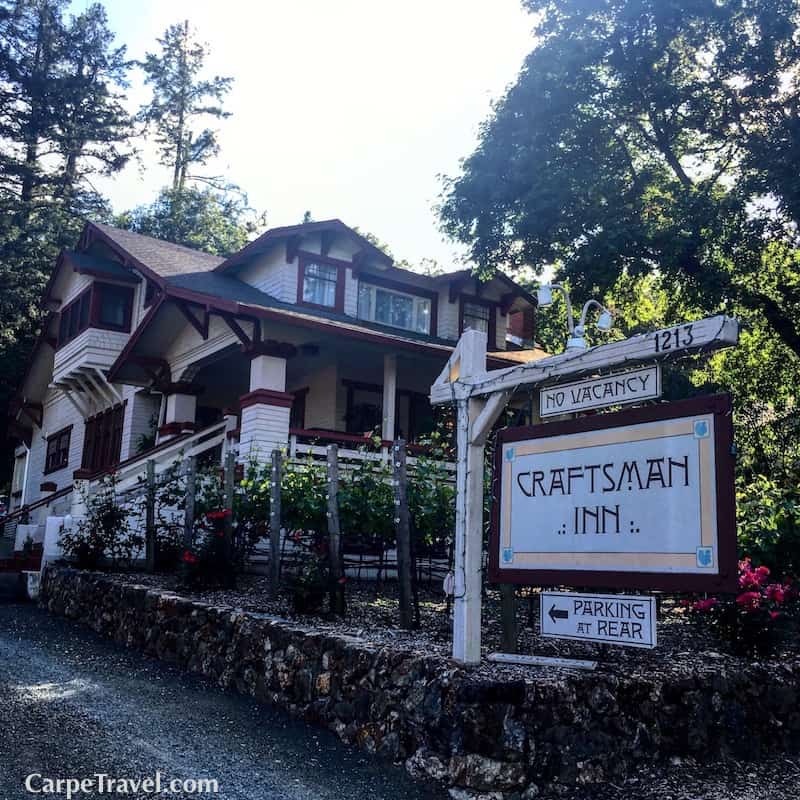 Have you stayed at The Craftsman Inn in Calistoga? Another Calistoga bed and breakfast? Share your experiences in the comments! The Craftsman Inn provided complementary lodging. They did not require that I express a particular viewpoint, all opinions are my own. Looks terrific! Thanks for the post. Thanks! Would love to know what you think about it if you stay there. A couple of girlfriends and I stayed there during a girls trip last year – it was amazing. We are going back next week with 8 of us! We have been looking forward to it all year. Thanks for the great article! The staff is wonderful, and talking on the porch during the evening was fantastic. That trip is one of my favorite memories. Can’t wait to go back! I’m so glad you liked the article and the hotel. It really is a great place to stay. I hope you ladies enjoy your girls trip. Cheers!